Hello, my name is Merlin. My mum was taken in by the Sleaford Cat's Protection as she was a stray and pregnant. I started my life with lovely Ruth who looked after me, mum and all my brothers and sisters while we got big enough to choose our forever home. I was the last of my family to leave and luckily Bob and Jennie came to visit and I decided they were the right people for me. At first I was a little bit scarred of hands but now, with the help of Ruth when I was a kitten, and Jennie and Bob, I love fusses and cuddles. My favourite things to do are play with my best friend Malachi, helping Jennie with her work and exploring. 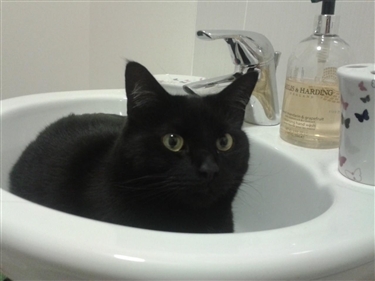 One of my favourite things to do is sleep in the sink, I know it's a little strange but I like it, it's even better when Bob turns the tap on and I get to play with the dripping water! Without the brilliant help of the Sleaford Cat's Protection I would never have such a wonderful life. Merlin has been with us for nearly 2 years and is the sweetest, funniest, cuddliest kitty I've ever had. He is so affectionate and loving and a real little character. He's settled in brilliantly and become another family member.